If you are looking for a new CNG vehicle or a CNG conversion technician, we can direct you to specific manufacturers or certified CNG converter technician for the type of vehicle you need. Clean N’ Green has put together a list of conversion companies in areas where we have fueling stations. 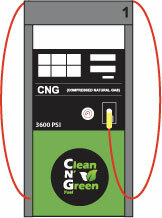 These companies have stated that they have the resources to convert or retrofit vehicles into CNG. It is possible to convert a regular vehicle into a CNG compatible vehicle, the cost to convert can range from about $12,500 to $22,500 depending on the vehicle, engine, size of CNG tanks needed, and who does the converting. With the initial cost of converting or purchasing a new CNG vehicle are higher than a regular gasoline or diesel vehicle; however, the paybacks on the vehicle are quicker due the reduction of fuel costs.